Amid a busy few weeks of nuclear-related news, an Israeli researcher made a very surprising OSINT discovery that flew somewhat under the radar. 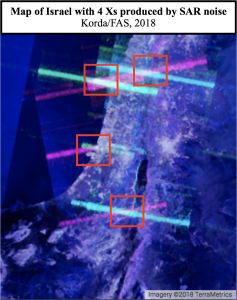 As explained in a Medium article, Israeli GIS analyst Harel Dan noticed that when he accidentally adjusted the noise levels of the imagery produced from the SENTINEL-1 satellite constellation, a bunch of colored Xs suddenly appeared all over the globe. SENTINEL-1’s C-band Synthetic Aperture Radar (SAR) operates at a centre frequency of 5.405 GHz, which conveniently sits within the range of the military frequency used for land, airborne, and naval radar systems (5.250-5.850 GHz)—including the AN/MPQ-53/65 phased array radars that form the backbone of a Patriot battery’s command and control system. 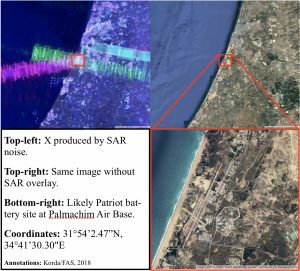 Therefore, Harel correctly hypothesized that some of the Xs that appeared in the SENTINEL-1 images could be triggered by interference from Patriot radar systems. Using this logic, he was able to use the Xs to pinpoint the locations of Patriot batteries in several Middle Eastern countries, including Qatar, Bahrain, Jordan, Kuwait, and Saudi Arabia. 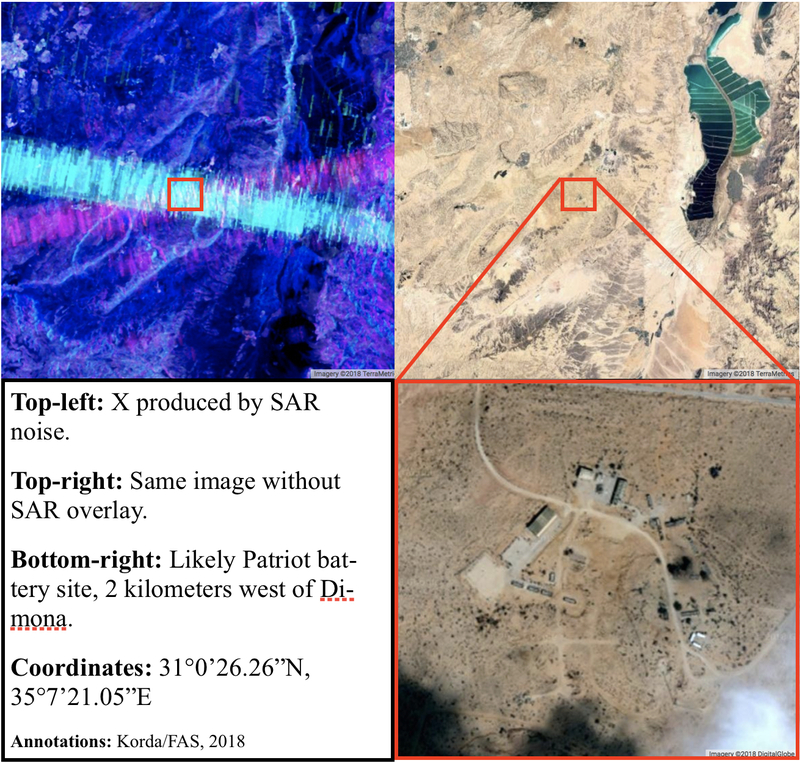 Harel’s blog post also noted that several Xs appeared within Israeli territory; however, the corresponding image was redacted (I’ll leave you to guess why), leaving a gap in his survey of Patriot batteries stationed in the Middle East. 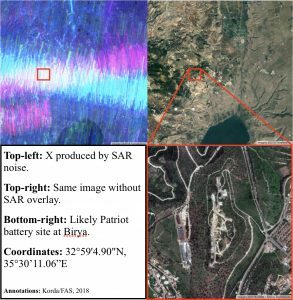 This blog post partially fills that gap, while acknowledging that there are some known Patriot sites—both in Israel and elsewhere around the globe—that interestingly don’t produce an X via the SAR imagery. 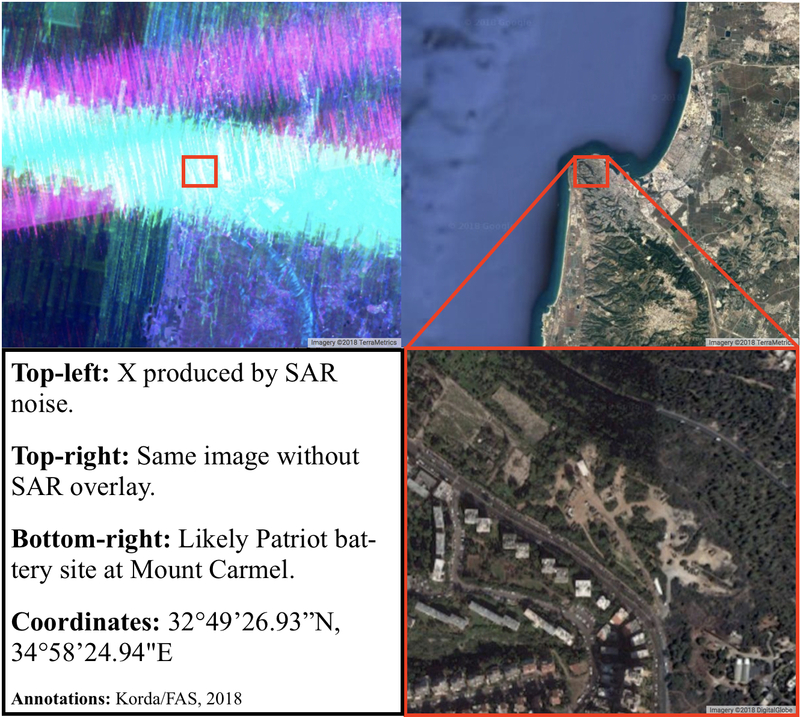 All of these sites were already known to Israel-watchers and many have appeared in news articles, making Harel’s redaction somewhat unnecessary—especially since the images reveal nothing about operational status or system capabilities. Looking at the map of Israel through the SENTINEL-1 SAR images, four Xs are clearly visible: one in the Upper Galilee, one in Haifa, one near Tel Aviv, and one in the Negev. All of these Xs correspond to likely Patriot battery sites, which are known in Israel as “Yahalom” (יהלום, meaning “Diamond”) batteries. Let’s go from north to south. The northernmost site is home to the 138th Battalion’s Yahalom battery at Birya, which made news in July 2018 for successfully intercepting a Syrian Su-24 jet which had reportedly infiltrated two kilometers into Israeli airspace before being shot down. Earlier that month, the Birya battery also successfully intercepted a Syrian UAV which had flown 10 kilometers into Israeli airspace. The Yahalom battery in the northwest is based on one of the ridges of Mount Carmel, near Haifa’s Stella Maris Monastery. It is located only 50 meters from a residential neighborhood, which has understandably triggered some resentment from nearby residents who have complained that too much ammunition is stored there and that the air sirens are too loud. The X in the west indicates the location of a Yahalom site at Palmachim air base, south of Tel Aviv, where Israel conducts its missile and satellite launches. In March 2016, the Israeli Air Force launched interceptors as part of a pre-planned missile defense drill, and while the government refused to divulge the location of the battery, an Israeli TV channel reported that the drill was conducted using Patriot missiles fired from Palmachim air base. Finally, the X in the southeast sits right on top of the Negev Nuclear Research Centre, more commonly known as Dimona. This is the primary facility relating to Israel’s nuclear weapons program and is responsible for plutonium and tritium production. The site is known to be heavily fortified; during the Six Day War, an Israeli fighter jet that had accidentally flown into Dimona’s airspace was shot down by Israeli air defenses and the pilot was killed. The proximity of the Negev air defense battery to an Israeli nuclear facility is not unique. In fact, the 2002 SIPRI Yearbook suggests that several of the Yahalom batteries identified through SENTINEL-1 SAR imagery are either co-located with or located close to facilities related to Israel’s nuclear weapons program. The Palmachim site is near the Soreq Centre, which is responsible for nuclear weapons research and design, and the Mount Carmel site is near the Yodefat Rafael facility in Haifa—which is associated with the production of Jericho missiles and the assembly of nuclear weapons—and near the base for Israel’s Dolphin-class submarines, which are rumored to be nuclear-capable. Google Earth’s images of Israel have been intentionally blurred since 1997, due to a US law known as the Kyl-Bingaman Amendment which prohibits US satellite imagery companies from selling pictures that are “no more detailed or precise than satellite imagery of Israel that is available from commercial sources.” As a result, it is not easy to locate the exact position of the Yahalom batteries; for example, given the number of facilities and the quality of the imagery, the site at Palmachim is particularly challenging to spot. However, this law is actually being revisited this year and could soon be overturned, which would be a massive boon for Israel-watchers. Until that happens though, Israel will remain blurry and difficult to analyze, making creative OSINT techniques like Harel’s all the more useful. 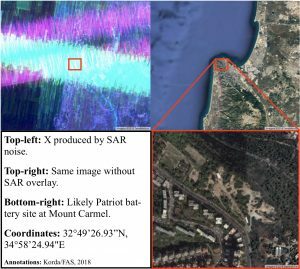 Sentinel-1 data from 2014 onwards is free to access via Google Earth Engine here, and Harel’s dataset is available here. Government oversight can take diverse forms even among Western democracies. A new report from the Law Library of Congress surveys the mechanisms of parliamentary oversight of the executive branch in Canada, Germany, Italy, Japan, Poland, Sweden, the United Kingdom, and the United States. The Law Library report does not provide comparative analysis, but simply presents a descriptive summary of each nation’s government oversight practices, with links to additional resources. Any policy conclusions to be drawn are left to the reader. See Parliamentary Oversight of the Executive Branch, Law Library of Congress, August 2017. I will be traveling to Tokyo next week to meet with government officials, academics, and citizens to discuss nuclear energy and other issues that FAS is analyzing. In particular, I will give a seminar talk at Meiji University during the afternoon of July 28. Then during the afternoon of July 29, I will lead a roundtable discussion at Waseda University. At the end of the week on July 30, I will present on the outlook for global use of nuclear power. This presentation will be part of a major public symposium at Hitotsubashi University on the theme of the “International Nuclear Order in the Post-Fukushima Order.” FAS members in Tokyo or other locations in Japan are welcome to attend that symposium. PBS NewsHour: After Japan Crisis, What’s Next for U.S. Nuclear Policy? Today at 2 pm, tune into NPR’s Science Friday with Ira Flatow for an update on Japan’s malfunctioning nuclear reactors and the evolving crisis. As continued attempts are made to cool the reactors and spent fuel rod pools at Japan’s Fukushima Daiichi nuclear facility, I’ll discuss the state of the deteriorating nuclear facility. Call with questions toll free at 800-989-8255.